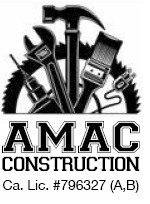 AMAC Construction and Restoration is a general contractor that provides construction, cleaning, and 24 hour emergency fire/water damage remediation. We are family owned and have been operating since 1978. We stand behind our work and guarantee your satisfaction. Become another one of our many satisfied customers. We can handle any residential or commercial project. We continually strive to provide our technicians ongoing training, to adopt innovative techniques, and to use new and improved equipment and processes to make our services more effective every year. Whether you experience damage from fire, flood, or vandalism, you can count on AMAC to respond.